The Code of Criminal Procedure was revised (by Act No. 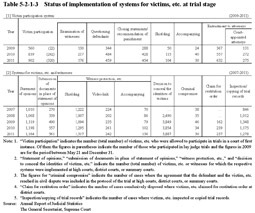 95 of 2007) and the victim participation system commenced on December 1, 2008. Under this system the court decides whether the victims, etc. of certain offenses can attend the court on the trial date as participating victims to thereby state their opinions on the performance of the public prosecutor, examine witnesses regarding circumstantial issues, question defendants in preparing statements of opinions, and state their opinions on the fact finding and application of the relevant laws, etc. When a participating victim attends the court on the trial date, etc., the court can take measures to shield the participating victim from the defendant or from the public in the court or allow the participating victim to be accompanied by a person the court deems appropriate. In addition, the Act on Measures Incidental to Criminal Procedures for Purpose of Protection of Rights and Interests of Crime Victims (Act No. 75 of 2000) and the Comprehensive Legal Support Act enable victims, etc., depending on their financial status, to apply for court-appointed attorneys when the victims, etc. entrust attorneys to participate in criminal proceedings on their behalf. Table 5-2-1-3  shows the status of implementation of these systems over the last three years. (2) Victims, etc. and witness protection, etc. From 2000, victims, etc. have been provided with the opportunity to express their feelings about the damage suffered from the offense and their opinions with regard to the case on the date of the trial or to instead submit documents stating their opinions. A victim of a criminal case often appears as a witness at a trial. There are various systems to protect a witness at the examination as follows: shielding a witness from the defendant or from the public at the court; an examination system in which the witness remains in a different room and is examined via audiovisual communication through the transmission of images and sound (video-link system); and being accompanied by a person the court deems appropriate. The shielding, video-link, and accompanying measures can also be used for victims, etc. when they express their opinions on the trial date. In addition, a system wherein information on the victims’ identity, including their names, is protected in criminal proceedings (decision to conceal the identities of victims, request to conceal the identities of victims upon disclosure of evidence) has also been implemented since December 26, 2007. Table 5-2-1-3  shows the status of implementation of these systems over the last five years. The defendant and victims, etc. involved in a criminal case can jointly request the court to make an agreement which has been reached in a civil dispute related to the criminal case included in the public trial protocol of the criminal case. Any such agreement included within the protocol has the same effect as a compromise reached in a civil trial (criminal compromise) which is a title of obligation to carry out a compulsory execution if the defendant fails to fulfill the duties. In addition, a restitution order system with regard to certain serious offenses has been in operation since December 1, 2008. It enables victims, etc. to claim restitution for the offense at the court which handles the criminal case. The court takes an exceptional trial procedure to reexamine the criminal records after conviction of the criminal case and issues a restitution order. Conventionally inspections or copying of trial records were only permitted at the request of a victim, etc. when a court deemed it reasonable and harmless in light of the purpose. The scope of the applicable cases, however, was extended in December 2007, and since then, in principle, courts must allow victims, etc. to inspect or copy all trial records (with victims, etc. of other offenses of similar kinds committed by the same defendant also being allowed to inspect or copy records if the court deems it necessary and relevant in exercising their right to claim damage compensation). 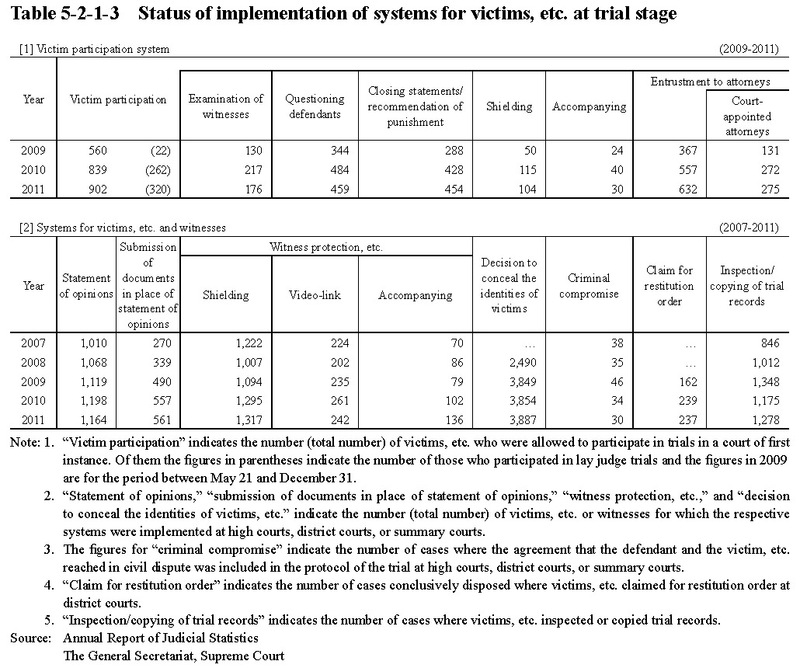 Table 5-2-1-3  shows the number of cases in which victims, etc. inspected/copied trial records over the last five years.